“I would liken having a number one hit the way we did, rather like Haley’s Comet. It’s rather like walking down the street and having your attention distracted and suddenly finding you’ve fallen down an open, unprotected man-hole,” described Andy Newman, the keyboard player with Thunderclap Newman. In addition to Newman, the band also featured singer/drummer John ‘Speedy’ Keene and guitarist Jimmy McCulloch. Keene was Pete Townshend’s flat mate and chauffeur, but he was a musician and songwriter in his own right and had written a song called Armenia City in the Sky which he played to Townshend who loved it and had it as the opening track on the 1967 album The Who Sell Out. In 1969 Pete and manager Kit Lambert paired Speedy up with Andy and Jimmy in the ready-made band Thunderclap Newman, which was intended as a showcase for the three musicians. Something in The Air was written by Speedy and originally called Revolution, but had to change it when The Beatles came out with a song using the same title. “The release coincided with the 1969 moon landing and was number one the week it happened so everyone just went for it”, explained Andy. In 1970 Terry Southern, with additional jokes by John Cleese, Graham Chapman and Peter Sellers, wrote the comedy The Magic Christian based on his own novel. It starred Sellers, Ringo Starr, Raquel Welch, Richard Attenborough and Spike Milligan. A thin plot about a wealthy man (Sellers) who adopts a young homeless dropout, (Starr) to be the heir of his wealth. The film featured two songs, Something in The Air and Badfinger’s Come and Get It. It also appeared in the 1970 film The Strawberry Statement which was more popular in America and helped the single climb into the Billboard top 30. It cropped up a third time in the 2000 movie Almost Famous. The song was also covered to great effect by Tom Petty and the Heartbreakers who just missed to top 50 in 1993. They charted one follow-up single, Accidents, which was also produced by Townshend but the group disbanded in 1970 just days before they were scheduled to start a tour of Scotland and weeks before they were meant to be part of a package tour with Marsha Hunt and others during The Who’s 12-week tour of the US. McCulloch joined Paul McCartney in Wings until his death in 1979 and Speedy later recorded two solo albums, as well as producing early albums for Motorhead and Johnny Thunder. Newman took up the saxophone and returned to the pub circuit. In March 2002, Something in The Air was used to launch a new television advertising campaign for British Airways, the same month, Speedy Keene died of heart failure. 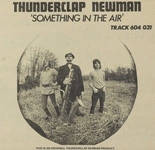 In February 2010, Newman performed as Thunderclap Newman with a new line-up at the Con Club in Lewes, Sussex. The line-up consisted of Tony Stubbings on bass, Nick Johnson on guitar, former Big Country member Mark Brzezicki on drums and Pete Townshend’s nephew Josh on rhythm guitar and vocals. Soon after, the band released a CD entitled Beyond Hollywood.